This trend continued in January, as the core PCE price index, the inflation indicator favored by the Fed, was just 1.8% higher than a year ago. The Fed’s stated target for annual core inflation is 2.0%, and core PCE has held in a narrow range at or just below this level for the past year. The latest figures on home construction were not encouraging, although unusually bad weather influenced the results. In February, overall housing starts fell 9% from January, which was far below expectations. Single-family starts posted an even larger decline of 17% from January to the lowest level since May 2017. Permits to build single-family homes, a leading indicator, were roughly unchanged. Builders point to rising land, labor, and materials costs, as well as high regulatory standards, as obstacles to additional construction. Looking ahead, the important monthly Employment report will be released on Friday. As usual, these figures on the number of jobs, the unemployment rate, and wage inflation will be the most highly anticipated economic data of the month. Before that, Retail Sales will be released on Monday. Since consumer spending accounts for about 70% of all economic activity in the U.S., the retail sales data is a key indicator of growth. The ISM national manufacturing index will come out on Monday and the ISM national services index on Wednesday. In addition, news about the British exit (Brexit) from the European Union could affect mortgage rates. Consumer spending accounts for about 70% of all economic activity in the U.S., so the retail sales data is a key indicator of growth. The report for the important holiday shopping period was delayed by the government shutdown, but it finally was released on Thursday, and it was very disappointing. Since weaker growth reduces the outlook for future inflation, the data was positive news for mortgage rates. In December, retail fells fell a massive 1.2% from November, far below the consensus for a small increase, and the largest monthly drop since September 2009. This was especially surprising since they have increased an average of about 0.4% per month since 2009. However, retail sales tend to be volatile month to month, and information from other sources such as the major credit card companies suggested that stronger spending took place around the holidays. The most recent major inflation data came in very close to the expected levels and had little impact on mortgage rates. The Consumer Price Index (CPI) is a widely followed monthly inflation report that looks at the price change for goods and services. Investors generally prefer to look at core CPI, which excludes the volatile food and energy components, to get a better sense of the underlying trend. In January, core CPI was 2.2% higher than a year, and it has held steady close to this annual rate of increase for many months. Uncertainty generally causes investors to shift from riskier assets such as stocks to safer ones such as bonds, including mortgage-backed securities (MBS). As a result, the recent difficulties in reaching a government funding agreement have increased the demand for MBS, which has been positive for mortgage rates. This week, however, the effect was reversed as the two parties in Congress put forth a last-minute compromise bill to avert another government shutdown, and it was signed by President Trump. Looking ahead, it’s going to be a very light week for economic data. The minutes from the January 30 Fed meeting will come out on Wednesday. These detailed minutes provide additional insight into the debate between Fed officials about future monetary policy and have the potential to move markets. Durable Orders, an important indicator of economic activity, and Existing Home Sales will be released on Thursday. Mortgage markets will be closed on Monday in observance of Presidents Day. At first glance, the headline figure for Friday’s Employment report made it look like January was another blowout with job gains above 300,000 for a second consecutive month. However, nearly everything that followed in the remainder of the report brought the results back toward the anticipated levels. Throw in distortions from the government shutdown, weather effects, and revisions, and in the end, investors viewed the data as just a little stronger than expected. Weaker than expected U.S. labor market data and a reduced outlook for global economic growth were favorable for mortgage rates this week, and rates ended at the lowest levels in about two months. Friday’s key labor market report showed continued solid job gains and wage growth, but it was modestly weaker than expected. Against a consensus forecast of 190,000, the economy added 155,000 jobs in November, and the revisions to the results for prior months were minor. 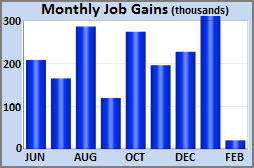 So far this year, average job gains have been 206,000 per month. The unemployment rate was unchanged at 3.7%. Average hourly earnings, an indicator of wage growth, were 3.1% higher than a year ago, which was the same annual rate of increase as last month and matched the fastest pace since 2009. Since weaker economic growth reduces future inflationary pressures, the small miss in the data was good for mortgage rates. The shortfall in the Employment report, along with a reduction in the outlook for global economic growth and growing fears of an escalation in the trade tensions with China, have caused investors to lower their expectations for the pace of tightening by the Fed in 2019. While most investors still believe that the Fed will raise the federal funds rate by another 25 basis points at the next meeting on December 19, they have significantly scaled back the anticipated number of rate hikes next year. Looking ahead, the Consumer Price Index (CPI) will come out on Wednesday. CPI is a widely followed monthly inflation report that looks at the price change for goods and services. Retail Sales will be released on Friday. Since consumer spending accounts for about 70% of all economic activity in the U.S., the retail sales data is a key indicator of growth. Industrial Production, another important indicator of economic growth, also will come out on Friday. In addition, the next ECB meeting will take place on Thursday and could influence U.S. mortgage rates. While there was a wide range of economic news, it was a quiet week for mortgage rates. Reaction to the inflation data, the election results, and the Fed meeting was minimal, and mortgage rates ended the week with little change. While higher inflation is negative for mortgage rates, the PPI data is very volatile month to month, so investors placed little weight on the results for October. If a similar surge is seen in the less volatile Consumer Price Index (CPI) report released next week, the reaction likely will be much larger. The midterm election results were in line with the scenario anticipated by investors and had little impact on mortgage rates. With control of the House switching to the Democrats and that of the Senate retained by the Republicans, investors expect that fewer major policy changes will be accomplished going forward. If this is the case, it may result in slower increases in government spending, which would reduce the amount of bond issuance needed to fund the budget deficit. As expected, Thursday’s Fed meeting produced no increase in the federal funds rate and few changes in the language in the Fed statement. Fed officials emphasized sustained improvement in the labor market, while noting that growth in business investment “has moderated” in recent months. The main point of debate about the appropriate pace of future rates hikes continues to center on whether to move quickly in response to the tightening labor market or to proceed more slowly and wait to see if it leads to a pickup in inflation. Looking ahead, the Consumer Price Index (CPI) will come out on Wednesday. CPI is a widely followed monthly inflation report that looks at the price change for goods and services. Retail Sales will be released on Thursday. Since consumer spending accounts for about 70% of all economic activity in the U.S., the retail sales data is a key indicator of growth. Mortgage markets will be closed on Monday in observance of Veterans Day. As was the case this week, stock prices and bond prices often move in opposite directions. The simple reason is that most economic events are influential because they change the outlook for future growth and inflation. Since a stronger economy is positive for stocks and negative for bonds (and vice versa), the two asset classes react to this type of news inversely. As the outlook for global growth slowed this week, investors shifted assets from stocks to bonds, pushing yields lower, including mortgage rates. 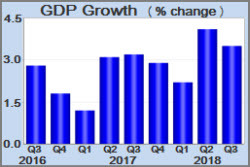 The first reading for third quarter gross domestic product (GDP), the broadest measure of economic growth, was 3.5%, above the consensus of 3.3%. This followed even stronger growth of 4.2% during the second quarter, making these the strongest back-to-back quarters since 2014. Strength was seen in consumer and government spending, while business investment was somewhat weak. Investors will be watching to see if the strong economic growth this year was due to transitory factors such as tax cuts and fiscal spending or whether it will be sustained in coming years. Since there are often large revisions to the initial GDP data, the relatively small outperformance versus expectations had little impact on financial markets. There were no significant surprises from Thursday’s European Central Bank (ECB) meeting. Despite future uncertainty related to Brexit (the British exit from the European Union) and Italy’s proposed budget, the ECB made no change in interest rates and confirmed its plans to conclude its bond purchases at the end of 2018. Looking ahead, the important monthly Employment report will be released on Friday. As usual, these figures on the number of jobs, the unemployment rate, and wage inflation will be the most highly anticipated economic data of the month. Before that, the Core PCE price index, the inflation indicator favored by the Fed, will be released on Monday. The ISM national manufacturing index will come out on Thursday. The big news this week was a major selloff in the stock market, with the Dow down more than 1,000 points. Normally that would be positive for mortgage rates, but this time the impact was minor. Weaker than expected inflation data was mildly positive, and mortgage rates ended slightly lower, but remain near their highest levels in many years. It is common to see mortgage rates fall when the stock market declines, and vice versa, but this is not always the case. It depends on the reason for the movement. Most of the time, the cause is shifting expectations for economic growth based on newly released data. Stronger growth is good for stocks, but it raises the outlook for future inflation, so it is negative for mortgage rates, and the reverse is true as well. This week, a wider range of factors influenced financial markets, most of which were negative for stocks. However, their expected impact on mortgage rates was mixed, and the net overall effect was small. For example, tariffs generally are a drag on economic growth, but they also raise prices, which leads to higher future inflation. In addition, the supply of bonds around the world is increasing. One reason is that global central banks are reducing their holdings of bonds. Also, the U.S. budget deficit is growing due to boosted spending and tax cuts, forcing the government to issue more bonds. To summarize, higher inflation and greater supply roughly offset slower growth. The most significant economic report released this week was Thursday’s inflation data. The Consumer Price Index (CPI), the most closely watched monthly inflation report, looks at the price change for finished goods and services. Thursday’s data revealed that inflation was lower than expected in September. Core CPI, which excludes the volatile food and energy components, was 2.2% higher than a year ago, the same annual rate of increase as the prior month. Since lower inflation is good for mortgage rates, this weaker than expected data caused rates to decline a bit. Looking ahead, Retail Sales will be released on Monday. Since consumer spending accounts for about 70% of all economic activity in the U.S., the retail sales data is a key indicator of growth. The minutes from the September 26 Fed meeting will come out on Wednesday. These detailed minutes provide additional insight into the debate between Fed officials about future monetary policy and have the potential to move markets. In the housing sector, Housing Starts will be released on Wednesday and Existing Home Sales on Friday. Since it raises the outlook for future inflation, the stronger than expected economic data released this week was bad news for mortgage rates, and rates reached their highest levels in many years. The biggest surprise in the data released this week came from Wednesday’s report on the services sector of the economy. The ISM national services index surged to 61.8, well above the consensus, and the highest level ever recorded since they began to track the data in 2008. Readings above 50 indicate that the sector is expanding. In their biggest move of the week, mortgage rates rose sharply following this news. Friday’s highly anticipated Employment report revealed that solid improvement in the labor market continued. Against a consensus forecast of 180,000, the economy gained just 134,000 jobs in September. 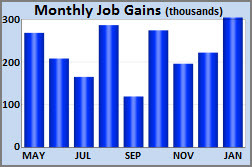 However, upward revisions added 87,000 jobs to the results for prior months, bringing the total gains above the expected levels. 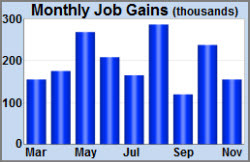 Because job gains are volatile month to month, investors also look at longer-term trends, and the economy has added an average of 211,000 workers per month so far in 2018, above even the strong pace of 182,000 seen over the same period last year. In addition, the unemployment rate unexpectedly declined from 3.9% to 3.7%, the lowest level since 1969. Average hourly earnings, an indicator of wage growth, were 2.8% higher than a year ago, the same annual rate of increase as last month. Looking ahead, the Consumer Price Index (CPI) will come out on Thursday. CPI is a widely followed monthly inflation report that looks at the price change for goods and services. The JOLTS report also will be released on Thursday. JOLTS measures job openings and labor turnover rates, and Fed officials value this data to help round out their view of the strength of the labor market. In addition, Treasury auctions on Wednesday and Thursday could influence mortgage rates. Mortgage markets will be closed on Monday in observance of Columbus Day.